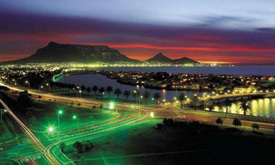 This grand 15-day journey offers a golfing and non-golfing itinerary with an amazing insight into virtually every well-known destination in South Africa. Starting in Pretoria, this magnificent sojourn will spend the first few days taking guests through the Drakensberg Mountains to Nelspruit*, the Kruger Park* and the historical areas of Pilgrim’s Rest, Bourke’s Luck Potholes and God’s Window. Then it’s on to explore the Kingdom of Swaziland*, Hluhluwe wildlife reserve and the world-heritage site, St Lucia Wetland Park. Day seven sees the train arriving in Durban* where guests can enjoy the markets or spiritual sites followed by a battlefields tour of Spionkop*. After city tours of Bloemfontein, the city of roses, Kimberley’s Diamond Mine Museum*, and the historic town of Graaff Reinet, guests arrive in Oudtshoorn to visit an ostrich farm and the incredible Cango Caves. Traversing the Outeniqua Mountains, the train arrives in the natural paradise of Knysna* where guests enjoy a lagoon ferry ride to Featherbed Nature Reserve followed by a spectacular meander along the Garden Route towards Worcester. On day 14, guests travel by road over scenic mountain passes to Hermanus*, once a renowned whaling station, before arriving on the final day in Cape Town for a tour of the Mother City. *Golf Courses (optional): Nelspruit/Leopard Creek/White River, Nkonyeni Golf, Zimbali, Durban Country Club, Champagne Sports Resort, Kimberley Golf Club, Fancourt, Ernie Els Oubaai, Arabella Golf Estate. 08h30 Check out of hotel. Luggage collected by Shongololo staff. Full-day tour of Pretoria or Johannesburg and Soweto. Join train at Capital Park in Pretoria. 09h00 Full-day tour of historical areas Pilgrim’s Rest, Bourke’s Luck Potholes and God’s Window. 17h00 Rejoin train in Nelspruit and depart for Malelane for overnight. 09h00 Tee off at Leopard Creek, Nelspruit or White River. 06h30 Full-day game drive in the Kruger Park. 17h00 Rejoin train in Malelane. 18h00 Depart for Swaziland. Overnight Mpaka. 09h00 Depart in vehicles from Mpaka, Swaziland. Visit Ngwenya Glass, Mbabane and Manzini. 18h45 After border formalities, depart for Hluhluwe, South Africa. 08h00 One-hour transfer to Nkonyeni Golf Estate for tee off. 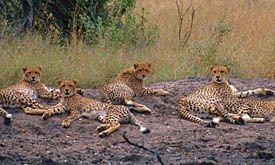 06h30 Game drives in Hluhluwe-Imfolozi Park. 18h00 Board train and depart for Empangeni. 09h00 Tour of the world-heritage site, St Lucia (iSimangaliso) Wetland Park. Afternoon visit to Dumazulu Cultural Village. 17h00 Board train and depart for Hluhluwe. 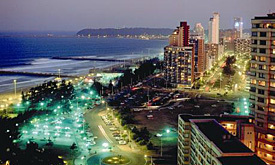 09h00 Full-day city tour of Durban including Victoria Market and uShaka Marine World OR spiritual tour to Mariannhill Monastery, Hare Krishna Temple and the Mahatma Gandhi Settlement. 16h00 Return to train and depart for Ladysmith. 09h00 Tee off at Durban Country Club. 09h00 Full-day battlefields tour taking in the Siege Museum, Wagon Hill and Spionkop. 17h00 Return to train and depart for Bloemfontein. 07h00 One-hour transfer from Ladysmith Station to Champagne Sports Resort for tee off. 09h00 Full-day tour of Bloemfontein including the Women’s Memorial, Anglo Boer Museum and Oliewenhuis Art Museum. 17h00 Return to train and depart for Kimberley. 09h00 Visit to the Big Hole and Diamond Museum. 17h00 Return to train and depart for Graaff Reinet. 09h00 Tee off at Kimberley Golf Club. 17h00 Return to train and depart for Graaff Reinet for overnight. 14h00 Enjoy a guided walking tour of Graaff Reinet. 17h00 Return to train and depart for Oudtshoorn. 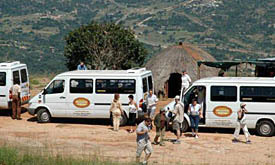 09h00 Visit the Cango Caves and an ostrich farm. Drive the montagu Pass to rejoin the train in George. 18h30 Dinner at Fancourt Golf Estate. 09h00 Drive the Montagu Pass to Fancourt Golf Estate for tee off. 08h00 Morning drive to Knysna with a lagoon ferry ride to Featherbed Nature Reserve OR enjoy shopping. 13h30 Return to train for lunch and depart for Robertson. 07h00 Transfer to Ernie Els Oubaai Golf Club for tee off. Return to train in the late afternoon. 09h00 Drive the scenic route to Hermanus (160km). 17h00 Return to train at Worcester for overnight and farewell dinner. Optional: Golfers can play at Arabella (140km). 10h00 Arrive Cape Town Station. Check out of train. Luggage delivered to hotel by Shongololo staff. Full-day tour of Cape Town. 18h00 Return to hotel. Tour ends.